Kathy Bartelmay, Curriculum Director, blogs about student agency and the 50th anniversary of Dr. Martin Luther King Jr.'s death. we become silent about things that matter. As I watched the coverage of the Washington March for Our Lives recently, I was moved by the appearance of Dr. Martin Luther King Jr.’s young granddaughter, Yolanda. She reminded the crowd that April 4th marks the 50th anniversary of her grandfather’s death. On one hand, I felt discouraged with the divisiveness and discrimination our nation still faces 50 years later. On the other hand, however, the immense energy that emanated from the young people on the dais with her gave me hope. The Ensuring Our Futures Project is one result of a curriculum goal our faculty has had for several years. We wondered, “How might we deepen our project work by helping students become upstanders-citizens who notice injustice in our world and work to change it?” We invited staff developers Sara Ahmed and Smokey Daniels to lead a two-day institute at Duke School based on their book Upstanders: How to Engage Middle School Hearts and Minds with Inquiry. We have continued the work from that institute on November and February professional development days, in teacher study groups, and in our classrooms. Musical Meghan’s Upstanders Project in chorus began with a spark from a song written by fifth grade Brook and Caroline in response to news reports about discrimination. First graders convinced me to buy still another Feelings Journal last week so that they could help feed hungry children in Durham through Backpack Buddies. And eighth graders Sophie and Zoe visited third grades last month to launch the curriculum they developed about the untold stories of American women as part of their National Identities Project. As we commemorate the life and death of Dr. Martin Luther King, Jr. today, I’m reminded of some words Robert Kennedy spoke to a crowd in Indianapolis as he announced Dr. King’s death. 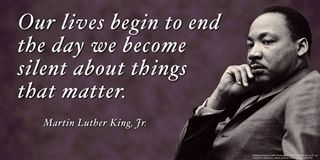 Martin Luther King dedicated his life to love and justice between fellow human beings. white or whether they are black. These words still ring true today, but the compassion and sense of justice our children are exhibiting give me hope. May we learn from them.